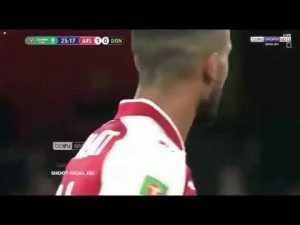 VIDEO: Arsenal vs Doncaster Rovers 1-0 – Highlights & Goals – 19 September 2017 3GP MP4 Download. Doncaster Rovers striker John Marquis drops to the bench with Alfie May on in his place. Jordan Houghton also starts, replacing Andy Williams. Arsenal make a number of changes from the side that drew with Chelsea at the weekend. Jack Wilshere makes his first start in 16 months for the club. Wenger has also gone with a strong attacking front line of Olivier Giroud, Alexis Sanchez and Theo Walcott, replacing Welbeck, Lacazette and Iwobi. Doncaster Rovers Substitutes: Marosi, Alcock, Toffolo, Garratt, Mandeville, Marquis, Williams. Doncaster Rovers XI (4-5-1): Lawlor; Blair, Butler, Whiteman, Wright; Kongolo, Mason, Coppinger, Rowe, Houghton; May. Arsenal Substitutes: Macey, Monreal, Willock, Dasilva, Iwobi, Nketiah, Akpom. Arsenal XI (3-4-3): Ospina; Holding, Mertesacker, Chambers; Maitland-Niles, Elneny, Wilshere, Nelson; Walcott, Giroud, Sanchez.